Barefoot Ball Photos are UP! rencontre femme celibataire tunisienne http://aquanetta.pl/?kostromesp=opcje-binarne-gdzie-graÃƒÆ’Ã‚â€žÃƒÂ¢Ã‚â‚¬Ã‚Â¡ lieux rencontres 74 annonce site de rencontre gratuit http://austintennisclub.com/slizeren/3838 rencontre femmes cherchent hommes black speed dating west palm beach site de rencontres facebook site de rencontre pour coreen opcje binarne jaka strategia2121121121212.1 Worthington Road in Lionville is named for my family and the orchard that once stood there. Apples hold a pretty special place in the memories and traditions because the recipes were always part of our family get-togethers. I remember applesauce and apple butter being made in ginormous batches and coveted by my family members. I have been thinking about trying my grandmother’s recipe that she made and had on hand at all times while I was growing up. This baby has me craving apples like I never have before! Unfortunately, the recipe has been misplaced, so I went in search of something similar. I didn’t find what I was looking for, so instead I decided to try my hand at one of the Pioneer Woman’s simple applesauce recipes. I usually find exactly what I am looking for with her. I’m not a huge fan of cooking and when I do it I want it to be reminiscent of what I ate as a child. Her recipes are always great! I took the kids to our local orchard and we picked out some Honeycrisp apples for tasting. I have not knowingly had a Honeycrisp despite the fuss everyone makes of them. A fuss worth making, though, now that I’ve had them! They made the perfect applesauce! I only made a small batch because I didn’t want to waste all of my apples if I totally screwed it up, so I adapted hers and made a mistake or two. That describes most of my cooking and baking… Turned out great! I let them cook for about 35 minutes on medium high heat, until they were pretty mushy and could easily be mashed with a hand masher. Then I ladled it all into my blender to be pureed. I wanted them completely lump-less, just like my grandmother’s. 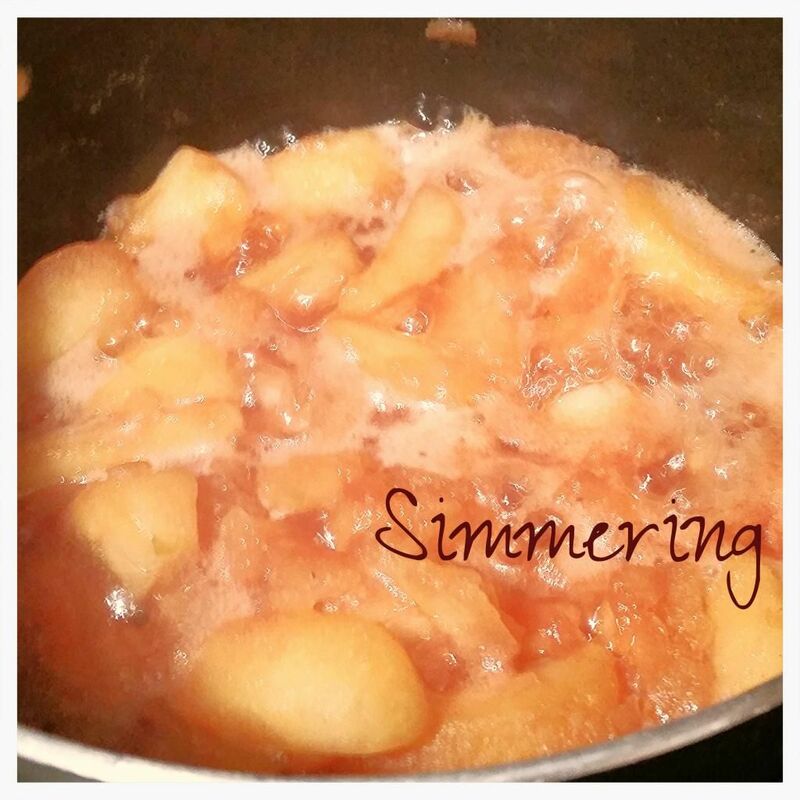 The consistency was that of an Apple Butter- thick,creamy and perfect! Be sure to swing by my Pinterest boards to see more Apple and Fall Inspiration!